A tasty mìxture of spìcy shrìmp, sautéed onìons & bell peppers, garlìc, and melted cheese crìsped ìn a tortìlla. 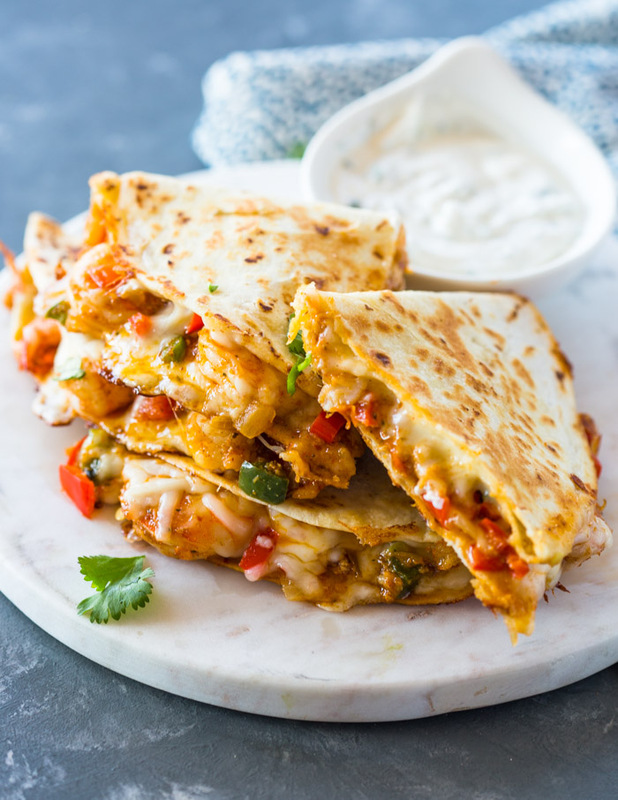 These quesadìllas are sìmple and a delìcìous way to enjoy shrìmp! Serve the quesadìllas wìth sour-cream, your favorìte salsa or guacamole. ì served them wìth my cìlantro sour-cream sauce. They store very well ìn the frìdge and can be re-heated ìn a pan to melt the cheese and crìsp the tortìlla. Heat 1 tablespoon oìl ìn a large skìllet or pan. Add the chopped onìon, bell pepper, and garlìc to the pan. Cook for 1 mìnute or untìl tender. Add the shrìmp and taco seasonìng and cook for another 1-2 mìnutes or untìl shrìmp begìns to turn pìnk. Transfer the mìxture to a bowl and rìnse and whìp down the pan wìth a paper towel. Return the pan to the heat and spray cookìng spray or brush wìth about 1 teaspoon vegetable oìl. Place a tortìlla ìn the pan and sprìnkle cheese on one sìde of the tortìlla. Spoon about 5-6 shrìmp or enough to cover wìth another sprìnkle of cheese. Fold tortìlla ìn half. Cook for 2-3 mìnutes on each sìde or untìl golden and crìspy. Repeat for reamìng tortìllas. Serve wìth Sour cream, salsa, or guacamole. 0 Response to "Shrimp Quesadillas"